Welcome to Dover Assembly of God! We're glad that you've joined us this morning. If you're on Facebook, we encourage you to take a moment to check in at Dover Assembly. 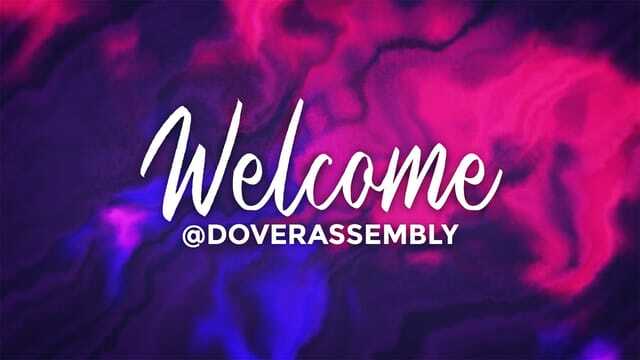 We are so glad you have chosen to attend Dover Assembly this morning. It is not by accident that you are here. We believe that God has allowed you to be here so that you might receive all that He has for you. We pray you are blessed as you allow the Lord to work in your life. NEXT Sun. Mar 17, we are going to cancel Sunday school and in it’s place we will offer an all-you-can-eat pancake breakfast designed to help the teens make their fundraising goal. The cost will be $5.00 for adults, $2.00 for kids ages 2-12 and under 2 years old will be no charge. Sign up in the lower foyer. Katlynn Havens & Lakelynn Wilson will compete in Districts, which includes the states of PA & DE. This is the annual event that has been our fundraising goal. It’s a great weekend of fun, fellowship and spiritual transformation. Keepthe teens in constant prayer to be open to what God has for them! TODAY IS THE LAST DAY TO REGISTER FOR YOUTH CONVENTION! Special thanks to Judy, Michelle, Yvonne and everyone who participated in last week’s BGMC Sunday! It was a blessing to see all the young people ministering to us and to the Lord! We raised $300 to go towards our annual goal. Thank you for your generosity! PTL! Last week, the teens raised $240 towards convention with the sales of the hot dogs and soda. WOW, what a blessing. Thanks to Paul, Lee, Katlynn, Jayden, Damien, Dakoda. Michelle & Noah Landis for setting up, making the hotdogs and cleaning up after it was over! dedicated adult who would be willing to rotate as a leader in our infant nursery. If would like to be a part of this vital ministry, please put your name and “nursery” on a blue card and put it in the offering plate. Thank you for your help! We are also in need of a few men to help our platform decorators, Brad & Katie. This would involve about 2 hours every 3-4 months as they redecorate the stage area. Please see Katie or Brad if you are available to help! Please take time to review and pray for those on this list. Drop them a card or call to set up a time to visit. They will be blessed! ~ Phil & Murina S.
Download the Dover Assembly app! We’re going to take a break from our study in Acts. It’s nice to have a different diet every once in a while, right? Every part of God’s word is beneficial. There is no “junk food” in God’s word. We’re going to look at Psalm 86 today. Normally before we study and section of scripture, we try to find out what is happening to cause a portion to be written. The context of the writing is vital to our understanding of why it is being written. However, in Psalm 86, there is not much known outside of the psalm itself. We know David wrote it, but not much in the way of specifics. The thing about God’s word is that it tells us everything that God want us to know, not everything there is TO know. If something is spelled out specifically, we would tend to apply it only to that type of situation. If something is not spelled out, it can be applied in a general manner. We’ll see what I mean as we go through it. We know that David wrote it and we know it was written as a prayer. It isn’t a complaint like Psalm 142 is. It wasn’t a recounting of a particular incident like Psalm 78 that recounts God’s work in Israel, or a song like Psalm 87. It was a prayer! How many have ever just read the psalms as your prayers? This psalm is a “generic” prayer for someone who is in desperate need. All we know is that Psalm 86:14 tells us that people are making David’s life miserable. Have you ever been in such a state that you just can’t get up or sit up? You are so despondent or so weak or feeble, that you can’t muster the strength or desire to stand. That is where David is in this psalm. He is asking God to lean down to him. The term for God that David uses is Jehovah. It is the most holy of the names God gives himself. David could have used any of the other names for God, Adonai, Elohim, and YHWH. He didn’t. He called him by the name that is unchanging. The God who keeps his promises. When we pray, we need to remember that our God is a God who keeps his promises. Once commentary tells us that, he was without supply of the necessities (food & water) -- also, full of wants that he is unable to provide for himself. If we can supply our needs then we really don’t need God. God always wants us to realize that all we have is from Him and that without him we are always in need. And real distress and misery cry out for God’s mercy. How many times have we prayed that prayer? David was asking God to protect him not only from his enemies but to protect him from the temptations that come along with his situation. “I am devoted to you”. I want to STAY devoted to you. It’s one thing to be in a situation where you need God to intervene, it’s another to have many ways to fix it yourself that you know aren’t right. Jesus was tempted in the garden because of the needs he had at that moment. He was hungry and thirsty and the devil tempted him to do what seemed logical and expedient at that time (make these stones into bread). Things that you feel would make your life better for the moment, but you know what God says about it. Lord, I want you to fix this for me. I don’t want to do anything on my own that may offend you. I trust you to do it best. The best of us will always be in need of mercy. What is mercy? Not getting what we DO deserve. And how often do we find ourselves in situations of our own doing and then need God to deliver us? That is asking for mercy -- not getting the results of our own decisions. Notice it wasn’t I’m sorry I got caught, can you help me. It was I am serving you constantly and yet have blown it. Would you please have mercy upon me? David didn’t live how he wanted then when things go south, he calls on God. He served him constantly, called on him constantly. He wasn’t a fair weather believer -- only calling on God when he needed something. Before he receives any answers to his prayer, he asks the Lord to restore his joy. The nearer we are to the Lord, the greater will our joy be. Joy is not dependent on circumstances; we receive joy from being close to the Lord. David is asking God to draw him closer to he has this joy. David could not get it himself; he needed God to do it. If you are in a despondent state, or even in normal life, we cannot muster joy in ourselves, and the more discouraged you are, the less you are able to draw close to God to receive the joy. When we pray for our circumstances, don’t wait for the answer before you ask God to restore your joy. You can have joy while you wait for the results of prayer. Don’t wait for your life to be perfect before you start enjoying it. Sometimes we may not like where we are, so we can’t enjoy what we DO have, while we wait for what we want. If you won’t like your life until you get a different job, meet someone, or even feel better, then 10-20-30 years are going to pass and you wouldn’t have enjoyed them. Let God give you joy while you wait. Enjoy what you do have, don’t lament what you don’t! Or your life will be over and you will have missed the good things God HAS given you. Why should you want and have joy? Because of the things, we have. Because of God’s blessings? We should have joy in the Lord because of his nature. Everyone should be ecstatic that God forgives. We are all sinners before God in need of saving from the wrath to come. Good at meeting our needs, good at forgiving, good at how he handles the world. As a part of His goodness, he abounds in love towards those who call on him. God loves everyone, but his love is only available to those who ask for it in the way of salvation. You can love someone, but if they don’t accept that love, you do not have a relationship with them. When people say God is a God of love and wouldn’t let anyone go to hell, sure God is love, but it only applies to people who have asked for it. What is our natural reaction when we focus on the goodness, mercy, and love of God? Doesn’t it push us to pray even harder? Knowing that God forgives our sins is good to us and abounds in love toward us. In other words, because you are forgiving, good, and abounding in love, please hear my prayers and my desperate need of you. It’s a lot easier to ask something of someone if you know they are predisposed to say yes. David truly believes in God’s goodness, so he is confident, not in his own goodness, but because of God’s goodness (not his), that God will hear him. We will all probably go through times of desperation, discouragement, despondency. Take them all to the Lord in prayer but equally important, to ask God to give you joy in the middle of them, while you wait and trust for His perfect answer. If God is forgiving and good, and loving and he keeps His promises and in His goodness we know he’ll answer, then the only thing we’ll need is joy while we wait and trust. Don’t wait for the answer to ask or have joy. We should want it now. And trust God for the future. Miss part of the sermon or want to share it with others? Catch the replay on Vimeo! If you haven't already, be sure to check out our website and follow us on social media @doverassembly! Have a great week!